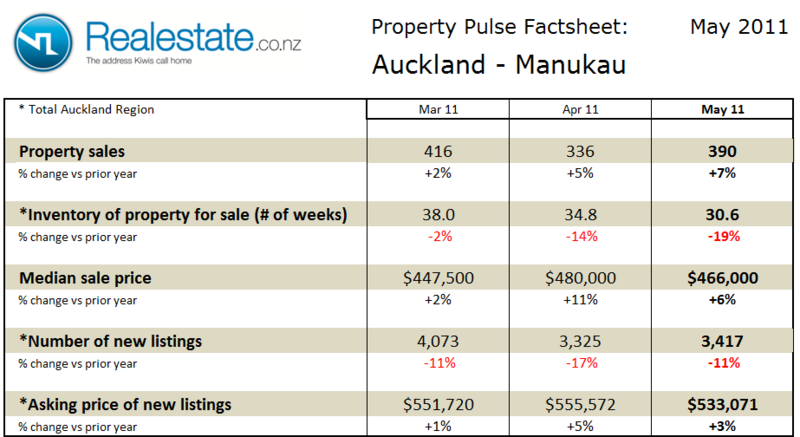 The Auckland – Manukau property pulse factsheet for May 2011 is published using data from Realestate.co.nz and REINZ (Real Estate Institute of NZ). 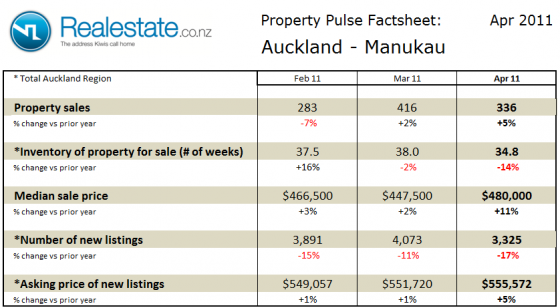 Property sales in the Manukau region of Auckland at 390 in the month rose slightly on a seasonally adjusted basis in May and were up 7% on May 2010. The inventory of unsold houses fell markedly to 30.6 weeks which sees it now sitting below the long-term average of equivalent sales. The median sales price at $466,000 was up 6% as compared to a year ago, but down on the prior month. The asking price expectation of new listings also fell to $533,071, although it is up 3% as compared to a year ago. 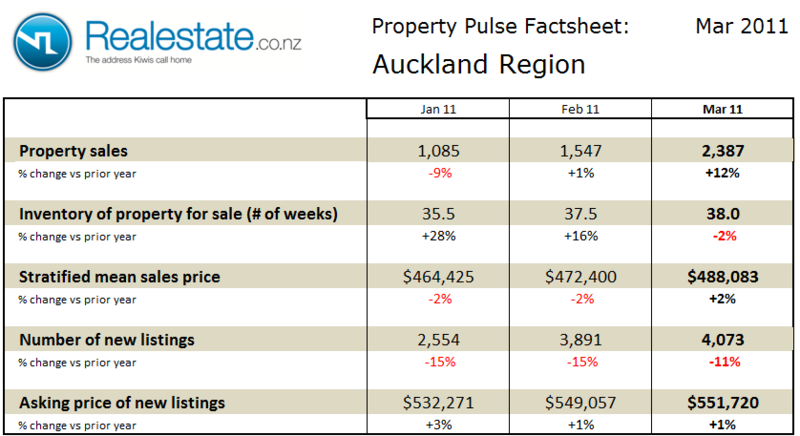 The Auckland region property pulse factsheet for April 2011 is published using data from Realestate.co.nz and REINZ (Real Estate Institute of NZ). Property sales across the Auckland region at 1,814 in the month fell on a seasonally adjusted basis in April and were up 6% on April 2010. The inventory of unsold houses fell markedly to 34.8 weeks which sees it sitting right on the long-term average of equivalent sales. The stratified mean sales price at $499,375 rose 6% as compared to a year ago and up from the prior 2 months. The asking price expectation of new listings also rose to $555,572 up 5% as compared to a year ago. The level of new listings coming onto the market across the Auckland region in April at 3,325 showed significant weakness down 17% as compared to a year ago. 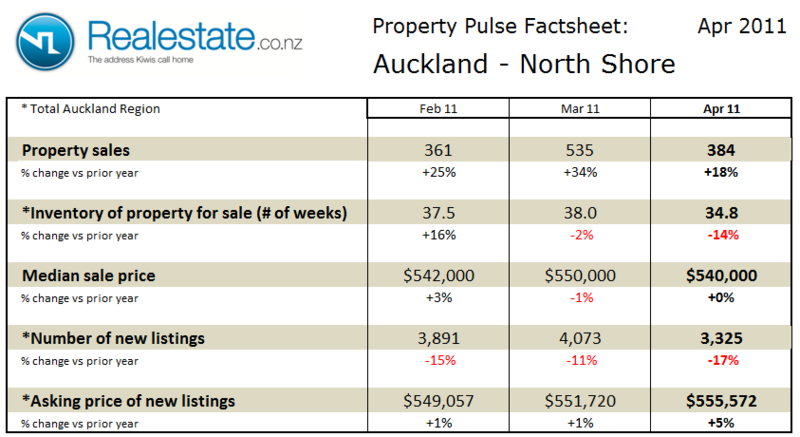 The Auckland North Shore property pulse factsheet for April 2011 is published using data from Realestate.co.nz and REINZ (Real Estate Institute of NZ). 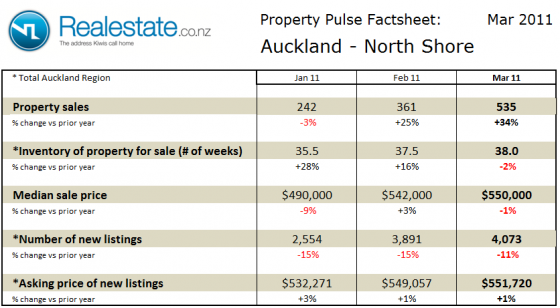 Property sales on the North Shore of Auckland at 384 in the month fell on a seasonally adjusted basis in April but were up 18% on April 2010. 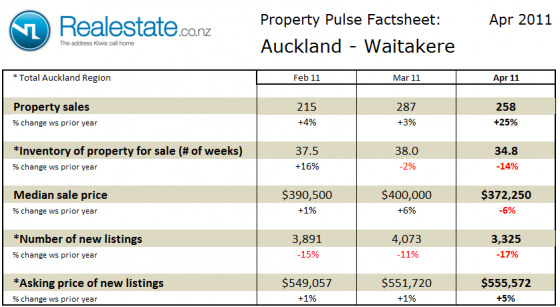 The inventory of unsold houses across the wider Auckland region remains right in line with the long-term average at 34 weeks of equivalent sales. The median sales price for properties sold on the North Shore in April at $540,000 was unchanged from a year ago but down slightly from last month. The asking price expectation of new listings across the wider Auckland region rose to $555,572 up 5% as compared to a year ago, and up on the recent 2 months. The level of new listings coming onto the market across the wider Auckland region in April at 3,325 showed significant weakness down 17% as compared to a year ago. 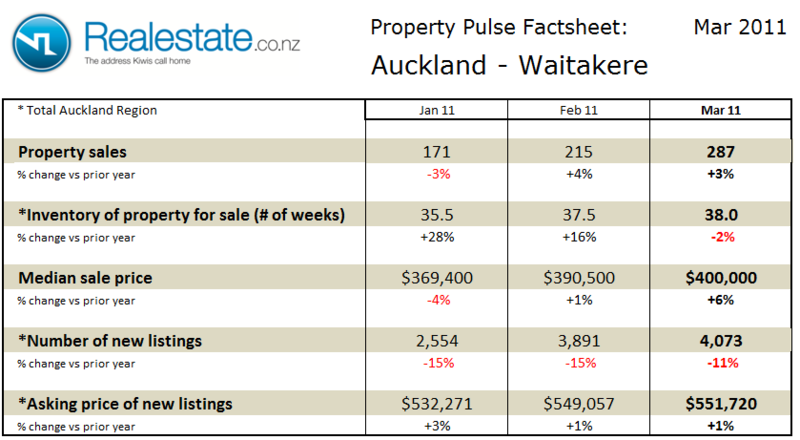 The Auckland – Waitakere property pulse factsheet for April 2011 is published using data from Realestate.co.nz and REINZ (Real Estate Institute of NZ). 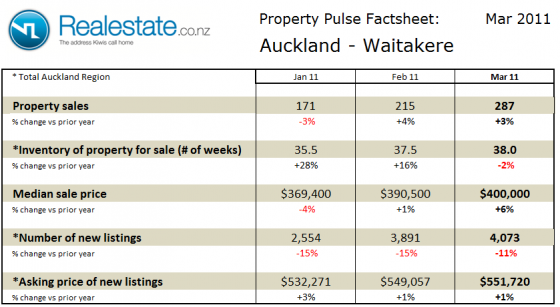 Property sales in the Waitakere are of Auckland at 258 in the month rose on a seasonally adjusted basis in April and were up a significant 25% on April 2010. The inventory of unsold houses across the wider Auckland region remains right in line with the long-term average at 34 weeks of equivalent sales. The median sales price for property in the Waitakere region of Auckland at $37,250 is down 6% as compared to a year ago and down from the prior month. The asking price expectation of new listings across the wider Auckland region rose to $555,572 up 5% as compared to a year ago, and up on the recent 2 months. The Auckland City property pulse factsheet for April 2011 is published using data from Realestate.co.nz and REINZ (Real Estate Institute of NZ). 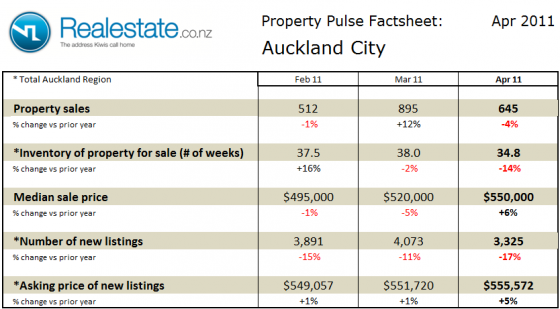 Property sales within the City of Auckland at 645 in the month fell on a seasonally adjusted basis in April and were down 4% on April 2010. The inventory of unsold houses across the wider Auckland region remains right in line with the long-term average at 34 weeks of equivalent sales. 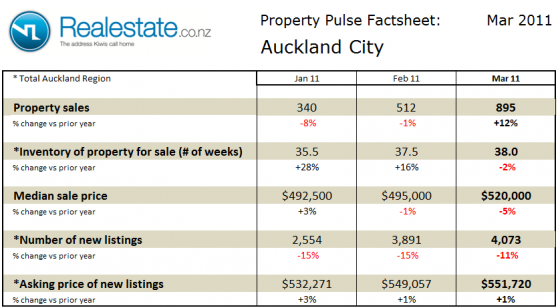 The median sales price for property in Auckland City at $550,000 was up 6% as compared to a year ago, and up significantly from the prior 2 months. The asking price expectation of new listings across the wider Auckland region rose to $555,572 up 5% as compared to a year ago, and up on the recent 2 months. 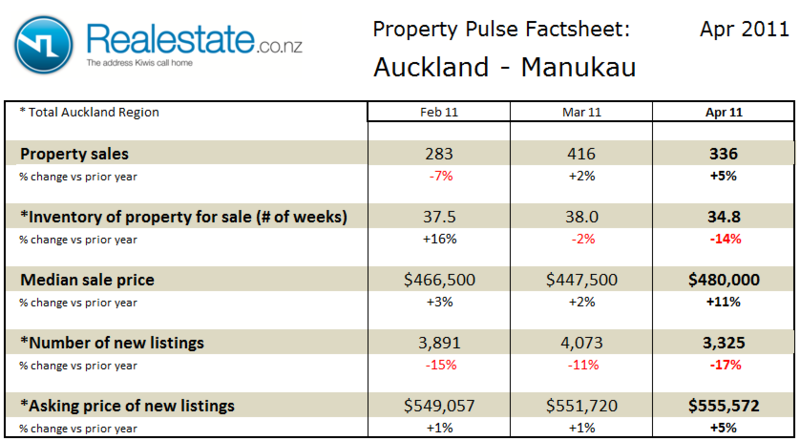 The Auckland – Manukau property pulse factsheet for April 2011 is published using data from Realestate.co.nz and REINZ (Real Estate Institute of NZ). 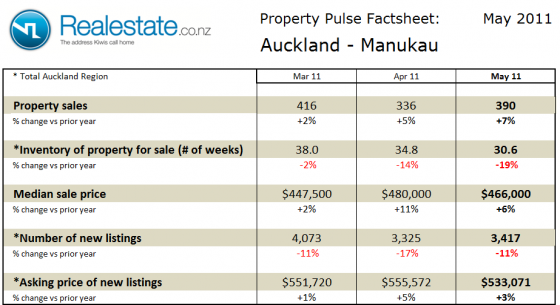 Property sales in the Manukau region of Auckland at 336 in the month fell slightly on a seasonally adjusted basis in April but were up just 5% on April 2010. 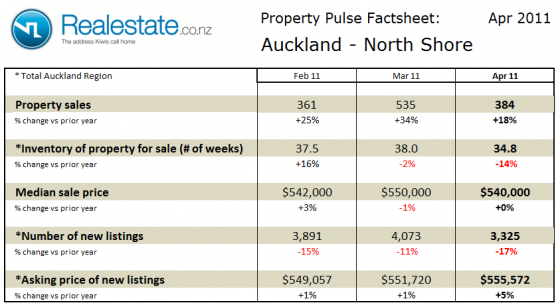 The inventory of unsold houses across the wider Auckland region remains right in line with the long-term average at 34 weeks of equivalent sales. The median sales at $480,000 was up 11% as compared to a year ago, and up significantly on the prior month. The asking price expectation of new listings across the wider Auckland region rose to $555,572 up 5% as compared to a year ago, and up on the recent 2 months. 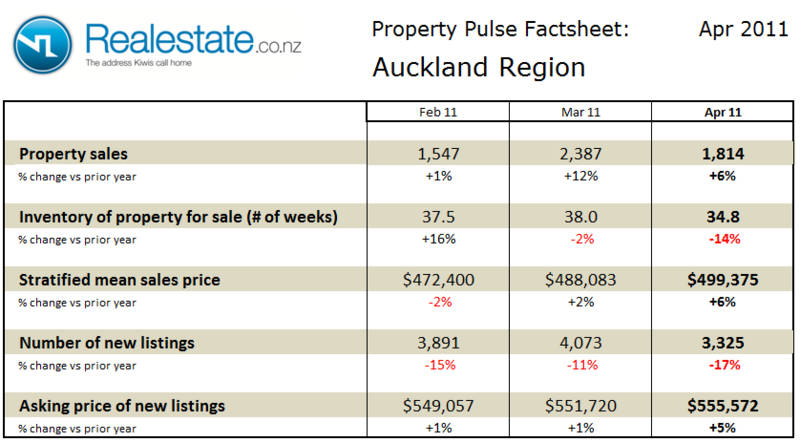 The Auckland region property pulse factsheet for March 2011 is published using data from Realestate.co.nz and REINZ (Real Estate Institute of NZ). Across the Auckland region property sales at 2,387 in the month rose significantly on a seasonally adjusted basis in March and were up 12% on March 2010. The inventory of unsold houses remains just above the long-term average at 38 weeks of equivalent sales. The stratified mean sales price at $488,083 is up 2% as compared to a year ago and up from the prior 2 months. The asking price expectation of new listings though is also up just 1% as compared to a year ago at $551,720. The level of new listings coming onto the market in March at 4,073 was up from February but down 11% as compared to a year ago. 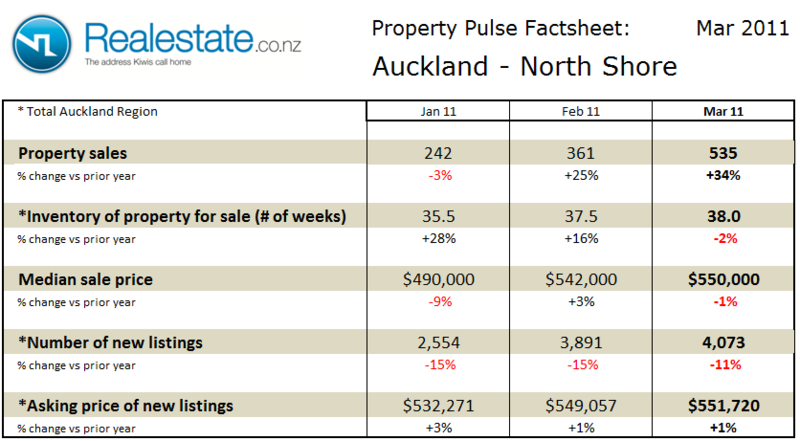 The Auckland North Shore property pulse factsheet for March 2011 is published using data from Realestate.co.nz and REINZ (Real Estate Institute of NZ). Property sales at 535 in the month rose significantly on a seasonally adjusted basis in March and were up 34% on March 2010. The inventory of unsold houses across the wider Auckland region remains just above the long-term average at 38 weeks of equivalent sales. The median sales at $550,000 is down 1% as compared to a year ago and up from the prior 2 months. The asking price expectation of new listings across the wider Auckland region is up just 1% as compared to a year ago at $551,720. The level of new listings coming onto the market in March across the wider Auckland region at 4,073 was up from February but down 11% as compared to a year ago. The Auckland – Waitakere property pulse factsheet for March 2011 is published using data from Realestate.co.nz and REINZ (Real Estate Institute of NZ). Property sales at 287 in the month rose significantly on a seasonally adjusted basis in March but were up just 3% on March 2010. The inventory of unsold houses across the wider Auckland region remains just above the long-term average at 38 weeks of equivalent sales. The median sales at $400,000 is up 6% as compared to a year ago and up significantly from the prior 2 months. The asking price expectation of new listings across the wider Auckland region is up just 1% as compared to a year ago at $551,720. The Auckland City property pulse factsheet for March 2011 is published using data from Realestate.co.nz and REINZ (Real Estate Institute of NZ). Property sales at 895 in the month rose significantly on a seasonally adjusted basis in March and were up 12% on March 2010. The inventory of unsold houses across the wider Auckland region remains just above the long-term average at 38 weeks of equivalent sales. The median sales at $520,000 were down 5% as compared to a year ago, but up significantly from the prior 2 months. The asking price expectation of new listings across the wider Auckland region is up just 1% as compared to a year ago at $551,720.